Embedded ZeroBlock Coding and context modeling (EZBC) algorithm has high compression performance. However, it consumes large amounts of memory space because an Amplitude Quadtree of wavelet coefficients and other two link lists would be built during the encoding process. This is one of the big challenges for EZBC to be used in real time or hardware applications. An improved EZBC algorithm based on bit length of coefficients was brought forward in this article. It uses Bit Length Quadtree to complete the coding process and output the context for Arithmetic Coder. It can achieve the same compression performance as EZBC and save more than 75% memory space required in the encoding process. As Bit Length Quadtree can quickly locate the wavelet coefficients and judge their significance, the improved algorithm can dramatically accelerate the encoding speed. These improvements are also beneficial for hardware. At present, the typical embedded wavelet-based image coding methods includes Embedded Zerotree Wavelet coder (EZW)  proposed by Shapiro, Set Partitioned in Hierachical Tree (SPIHT)  proposed by Said etc., Set Partition Embedded block algorithm (SPECK)  proposed by Asad Islam, Embedded Block Coding with Optimal Truncation (EBCOT)  used in JPEG2000 , and Embedded ZeroBlock Coding and context modeling (EZBC)  proposed by Shih-Ta Hsiang etc. Among these algorithms, EZW and SPIHT were based on the local characteristic in spatial-frequency domain of wavelet transform. They utilized the similarity of wavelet coefficients of the same spatial location in different subbands. SPECK was based on the characteristic that the energy concentrated in low-frequency subband and the insignificant coefficients mainly concentrated in high-frequency subbands after wavelet transform, it utilized the correlation of insignificant coefficients in the same subband. EBCOT used the correlation of wavelet coefficients in the same subband to build the high efficiency context and adopted the Arithmetic Coder. EZBC utilized the correlation of coefficients in the same sub-band and coefficients in different subbands at the same time and adopted a simple and efficient quadtree coding structure and context-based bitplane encoding method [6, 7], so it can achieve higher compression performance than SPIHT and EBCOT. EZBC algorithm is widely used in digital image compression and scalable video coding. However, during the encoding process EZBC built an Amplitude Quadtree Q k [l](i, j) and two link lists: the insignificant nodes link list LIN and the significant pixels link list LSP. Both Amplitude Quadtree Q k [l](i, j) and the link lists consumed a large amounts of memory space and this was one of the big challenges for the EZBC to be used in real time or hardware applications. As it has a large amount of operations of link lists such as adding and deleting nodes during encoding, this made its coding efficiency decline greatly when good image quality is required. The algorithm proposed in reference  presented the significance state-table of Quadtree coefficients to record the significance state change of all the QuadTree corresponding coefficients in the coding of Quadtree bitplane, which removed the LIN and LSP. Some memory was saved but Q k [l](i, j) was still adopted in the algorithm. Instead of making any radical change, it increased the complexity of the algorithm on the contrary. In order to overcome these disadvantages, an improved EZBC algorithm, Bit Length EZBC (BL-EZBC) based on bit length of coefficients, was put forward in this article. It used Bit Length Quadtree instead of Amplitude Quadtree of wavelet coefficients and other two link lists, so it can save more than 75% memory space required in the encoding process. As Bit Length Quadtree can quickly locate the wavelet coefficients, judge their significance, and avoid a large amount operations of link lists used in EZBC, this algorithm can accelerate the encoding speed effectively. The test results indicates that this algorithm achieves the same signal to noise ratio as EZBC and gains much higher encoding speed, saves 75% memory usage than EZBC. where C k (i, j) is the quantized subband coefficient at position (i, j). |x| indicates the absolute value of x; x indicates the rounding operation on x. For example, if x = ⌊ 3 . 8 ⌋ , then x ≡ 3 where " = " means assignment and "≡" indicates the equality test. Below is an example for B k [l](i, j). If C k (i, j) = (± 9), then B k (i, j) = 4. That is, the significant bit length of ± 9 is equal to 4. Each bottom quadtree node is assigned to the bit length of the subband coefficient at the same position. The quadtree node at the next level is then set to the maximum of the four corresponding nodes at the current level, as illustrated in Figure 1a. The top quadtree node is just equal to the maximal bit length of all subband coefficients. Similar to the conventional bitplane coders, we progressively encode subband coefficients from the MSB toward the LSB. In the Bit Length Quadtree, a node is significant if the value of the node B k [l](i, j) is great than the index of the bitplane. A significant pixel (coefficient) is located by the testing and splitting operation recursively performed on the significant nodes up to the pixel (bottom) level of a quadtree, as shown in Figure 1b. 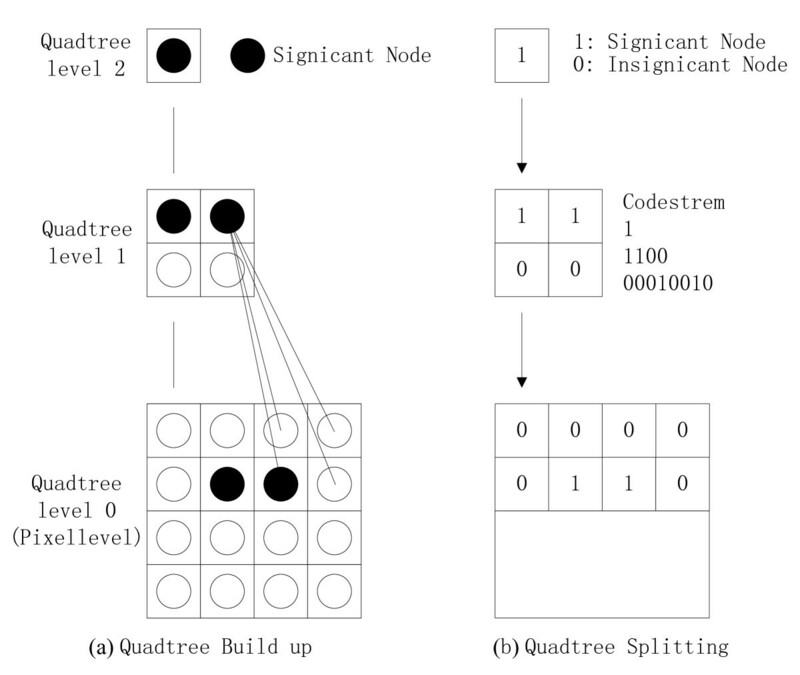 Illustration of quadtree build up and decomposition. (a) Quadtree build up and (b) Quadtree splitting. Instead of using Amplitude Quadtree Q k [l](i, j) and two link lists in EZBC, the bit length of the Quadtree in BL-EZBC is built up with the bit length of the absolute value of the subband coefficients. It corresponds to the index of the bitplane. It means that Bit Length Quadtree can quickly locate the wavelet coefficients and judge their significance. Thus, it can accelerate the encoding speed effectively. And the lists of insignificant nodes LIN and significant nodes LSP required in EZBC are not necessary in BL-EZBC. What iss more, the usual bit length of wavelet coefficients is 16. That is, each node of Amplitude Quadtree Q k [l](i, j) uses 16 bit length memory. However, in BL-EZBC, each node of the Bit Length Quadtree B k [l](i, j) uses 4 bit length memory. For 4 bit length, the max value it can represent is 15. It means that the corresponding max absolute value of wavelet coefficients is 215 - 1 = 32767. Generally, the absolute value of the wavelet coefficients is less than 32767. That is, 4 bit length of each node of Bit Length Quadtree can represent the bit length of wavelet coefficients. This saves a large amount of memory space required in the coding process. C k (i, j): the quantized wavelet coefficient of subband k at position (i, j). B k [l](i, j): Bit Length Quadtree B representation for the bit length of coefficients from the same subband with node of B k [l](i, j) corresponding to a quadtree node at position (i, j), Suband k, and level l. Its value is defined by (1). D k : depth of the quadtree of the subband k.
D max : the maximum quadtree depth among all subbands. K: total number of subbands. X k : Horizontal offset of the subband k referring to the original image, left-to-right as a positive direction. Y k : Vertical offset of the subband k referring to the original image, top-to-down as a positive direction. CodeBL(k, l): Function for coding the insignificant node of level l in Bit Length Quadtree of subband k. Its parent node should be signficant in the last bitplane if it exists. CodeDescendant(k, l, i, j): function for processing all the descendent nodes of B k [l](i, j) after it just tested significant against the current threshold. CodeLSP(k): function for refinement of the coefficients of subband k.
for all (i, j) in quadtree level 0, subband k. That is, all the nodes in level 0 of Bit Length Quadtree of subband k, scanning first in row then column. * if (B k (i, j) > n), output the value of | C k (I + X k , j + Y k ) | in bitplane n.
The improved algorithm BL-EZBC and the original EZBC were verified and compared in Pentium(R) D CPU 2.80 GHz computer with 512 × 512 × 8 bits Standard grayscale images of Lena, Goldhill and Barbara. 9/7 Wavelet filters boundary symmetrical extension was used. The context model was the same as which used in EZBC algorithm, the algorithm data in reference  were quoted here. Table 1 listed out the PSNR comparison. Table 2 shows the memory usage comparison during coding. Table 3 shows the coding time comparison with different thresholds of BL-EZBC and EZBC. Coding time comparison with different threshold with BL-EZBC and EZBC (ms). From Table 1, the same PSNR was achieved by using BL-EZBC, algorithm in reference  and EZBC. However, EZBC used Amplitude Quadtree Q k [l](i, j) and two link lists (LIN and LSP) to finish the coding process and utilized the significance of the neighbor nodes and the node in parent subband to construct the context, so a large amount of memory was required to store Amplitude Quadtree Q k [l](i, j) and two link lists. Therefore, more memory was required for more complex image and higher coding bit rate. These increased the complexity of the hardware. Although linked lists LIN and LSP were removed from the algorithm in reference , Amplitude Quadtree Q k [l](i, j) and significance state-table of Quadtree coefficients were still adopted, which also occupied a lot of memory and increased the algorithm complexity. Bit Length Quadtree was presented to replace the Amplitude Quadtree in the improved algorithm, which was used to complete the coding process and construct the context, so the memory usage was greatly reduced during the coding. As shown in Table 2, by using the improved algorithm BL-EZBC, more than 75% memory was saved compared to the original EZBC algorithm. Therefore, the memory usage was significantly reduced. As EZBC used a large amount of operations of link lists such as adding and deleting nodes during encoding, this made its coding efficiency decline greatly when good image quality was required. Instead of using Amplitude Quadtree Q k [l](i, j) and two link lists in EZBC, the bit length of the Quadtree in BL-EZBC is built up with the bit length of the absolute value of the subband coefficients. It corresponds to the index of the bitplane. It means that Bit Length Quadtree can quickly locate the wavelet coefficients, judge their significance. Thus, it can accelerate the encoding speed effectively. As shown in Table 3, if the threshold less than 32, the coding time of BL-EZBC was significantly less than EZBC. If the threshold is great than or equal to 32, the coding time of BL-EZBC was less than EZBC too. However, it was not so obvious. A larger threshold means less bitplanes would be scanned, the size of link lists was smaller, and the operations of link lists were also fewer. As the larger threshold means the worse image quality, in most situations in order to achieve better image quality the threshold was not so large. When good image quality was required, the coding speed of BL-EZBC is significantly faster than EZBC. An improved algorithm BL-EZBC based on EZBC was proposed in this article. A new model Bit Length Quadtree was used to complete the coding process and construct the context. It can achieve the same compression performance as EZBC but the memory usage was greatly reduced during the coding process. Bit Length Quadtree can quickly locate the wavelet coefficients, judge their significance, and avoid a large amount operations of link lists used in EZBC. Thus, it can accelerate the encoding speed effectively. These improvements are also beneficial for the hardware. Set Partitioned in Hierachical Tree. This work was supported in part by the Shenzhen Double Hundred Person Project and the Shenzhen University Dr start-up fund research (000201) of China.